This chapter vividly describes God's unlimited power over the natural forces. It makes repeated reference to the Almighty's "voice," and speaks of its capability to dry oceans (verse 3), destroy the strongest trees (verses 5-6) and even entire forests (verse 9), and split flames of fire (verse 7). 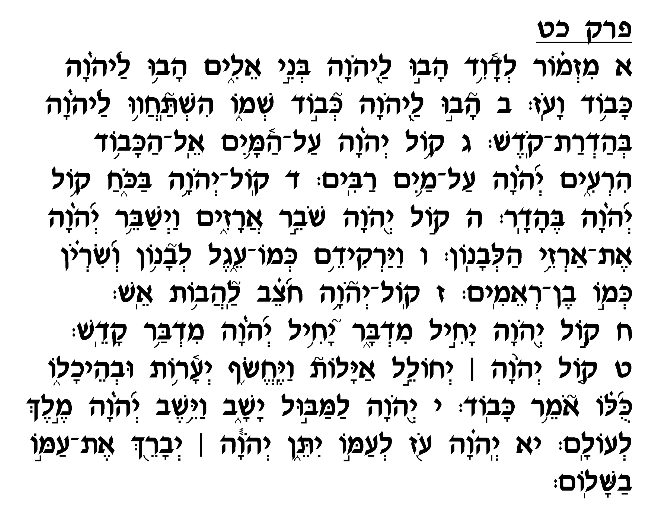 Towards the end of the Psalm, David points to perhaps the most extreme manifestation ever of the Almighty's power – the Mabul, the deluge during the time of Noach, which firmly established God's unquestioned, eternal kingship over the earth ("Va'yeshev Hashem Melech Le'olam" – verse 10). In this Psalm's final verse, David foresees the blessings of strength and peace that God will bestow upon Am Yisrael. After the descriptions of the Almighty's frightening and destructive force, David reassures us that this destruction will befall only those who reject God's kingship and authority. His faithful servants, however, will be spared His vengeance and will instead receive His personal protection and blessing.